Sneaking in a little World of Warcraft during business hours is probably a great way to get yourself fired from most jobs—but it seems that spending your personal time in an MMORPG may actually make you a better employee. 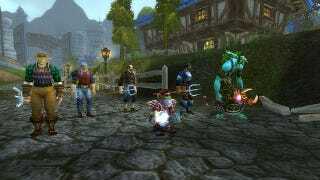 As the Huffington Post reports, researchers at Newcastle University Business School and the University of Crete looked at how employees who were MMORPG players performed and, in particular, how they shared and exhibited leadership behaviors. Perhaps unsurprisingly, learning how to be on time for your guild raid and how to work together in a seamless team to conquer a virtual enemy also teach people how to work well in teams in the physical world. "From collaboration to meeting targets, team work to resolve complex missions, strategic planning, allocating resources, to recruiting new players to form groups, there is a clear link between the skills needed to enjoy a good game performance, and the real corporate world," Dr. Savvas Papagiannidis, the lead researcher, explained. "For this reason, the players who have had to manifest good leadership skills and gaming behaviours to succeed in MMORPGs, were more likely to see these characteristics spill over from games to their real work-life. This spill over effect was particularly evident when combined with high performance standards in the game." Those players who saw the most success in their MMORPG adventures were likely to bring their online behaviors offline, and change the way they acted in the working world to be more like their digital successes. Playing an MMORPG also has advantages over more traditional kinds of training because players learn by doing, in a very hands-on way. For many of us, that's what makes most learning stick. Companies have been developing training simulations and "serious games" of all kinds for years, to teach their workers not only specific tasks but also the "soft skills" of people management, communication, and leadership. But maybe a little weekend raiding is all it really takes. Just don't stand outside an empty conference room saying, "LFG" over and over. That trick never works.